Designed with nature in mind, this facility complements its surroundings with stone, wood and contoured landscaping. 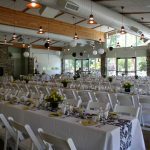 Barber Park Event Center resides along the Boise River – here you can enjoy a gorgeous outdoor reception or tuck yourself inside next to the fireplace on a crisp October evening. For large events, rent the entire center. Capable of holding 250 guests indoors, the center is 3,136 sq. 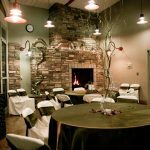 ft. and features stained stamped concrete floors, 2 fireplaces, large glass windows, wood and stone accents. The building cannot be rented for more than one year in advance. Dates that are on an application hold without a deposit or contract are subject to a DATE CHALLENGE. Upon receiving a notification to challenge a date, County will notify the holding party of the Date Challenge. The holding party who requested the date originally will have 48 hours from notification to sign the contract at the established rate and post the first scheduled payment. Failing this, the challenger may have the date after they have posted their contract and first scheduled payment. This policy is in effect to prevent too many request holds by Renters who are looking in to other venues. Should Renter cancel an event, Renter must notify Parks and Waterways Management in writing. If the written notice is received sixty (60) or more days prior to the first day of event, Renter shall forfeit twenty-five percent (25%) of the contract amount and Renter shall receive a refund of the balance of monies paid toward the contract amount after deducting twenty-five percent (25%) of the contract amount and any costs and incidental charges incurred by County in preparing for Event. If the written notice is received less than sixty (60) days prior to the first day of event, the entire amount paid by Renter shall be forfeited, and Renter shall remain fully liable for any remaining balance on the contract amount as well as all incidental costs and charges incurred by County in preparing for event. Events are allowed to provide their own services. The exception to this is in regards to alcohol you are not allowed to bring alcohol into the venue you must use the exclusive alcohol provider. Barber Park and Ada County do not guarantee or endorse the services of any of the listed businesses: it is up to the Renter to decide whether or not to do business with them. If one of these providers is used, you will not have to supply their insurance requirements as we have them on file. However, we are not held responsible for a lapse in their policy due to circumstances unknown to us. If this is the situation, we will notify you upon receipt of your event worksheet one month prior to your event OR if you would like to use someone different, you will be required to make sure they comply with the insurance requirements in your contract. Vendors not on the vendor list will need to provide the following insurance requirements this policy is in effect to protect you as the renter of the Barber Park Education and Event Center we do require that all vendors or suppliers you hire or are a business in the service or product they are supplying to your event will provide the following insurance. Current General Liability certificate; $2,000,000/$1,000,000 amounts. Vendor shall be named insured on the policy(s) and Ada County and its elected officials, agents, employees, successors and assigns shall be included as the additional insured under the CGL. Workers Compensation meeting the statutory requirements of the State of Idaho. Business Automobile liability providing bodily injury and property damage coverage for not less than $1,000,000 each accident limit. Automobile liability insurance shall be written on a standard ISO policy form, or an equivalent form, providing coverage for liability arising out of owned, hired, or non-owned vehicles in connection with this agreement. Parking is regulated by Ada County Code: It shall be unlawful for any person to park any vehicle on, or own any vehicle found to be parked on, or to otherwise obstruct with such person’s property, or own any property found to be obstructing any space reserved for the parking of vehicles of the employees of the county of Ada, and which reserved parking space is located on real property owned by or leased to the County of Ada. Violation of this Section shall constitute a misdemeanor. Also, any vehicles so parked may be removed at the expense of the owner thereof. During the summer floating season vehicles entering Barber Park will pay the listed fee for parking on that day. Monday through Thursday the fee is $5.00 per car; Friday through Sunday and holidays the fee is $6.00 per car. When the parking lot and field fill up completely, we must lock the gate into the parking lot. You may consider a shuttle bus. Even if the gate is locked, busses are allowed into the park to drop off and pick up guests. Parking and vehicle rules will be strictly enforced by Ada County, vehicles violating any provision will be subject to ticketing and/or towing (Rocky Mountain Towing 208-861-2880) at the owner’s expense. Renters, please communicate all parking and vehicle regulations to your guest, staff, and vendors. Together we can reduce problems during events. Parking in fire lanes by anyone will result in immediate towing. Parking in 15-minute loading zones will be strictly enforced. Parking options (floating season only): Have us tally your guest’s parking and invoice you for the charges, (which will be due upon receipt of invoice) or to have your guests pay for their own parking. For events on Saturday and Sunday, the Booking Coordinator will mail eight (8) parking passes to the Renter prior to the event. The Renter may distribute to whom they would like. All other guests and vendors will be accommodated by the Renters parking option choice on the event worksheet. The building may be rented at $50 per hour for rehearsals. The rehearsal must occur Monday – Friday from 8:00 a.m. to 4:00 p.m. and is subject to availability. You must contact the office no earlier than the Monday prior to your event to reserve the facility. 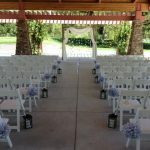 TABLE & CHAIR SETUP – We will send you a link a minimum of 60 days prior to your event. If you would like this link sooner please contact us at 208-577-4576 or eec@adacounty.id.gov. Once the floor plan is submitted it will be locked for editing. Contact us if you need to make any changes and we will unlock the floor plan. Table placement, bar location, dance area, etc. Place the number of chairs you would like at each table. Number of chairs is in the center of the table drawing. Please tell us if you would like extra table or chairs left in the building. Your event will be set up according to your drawing by 8 am on the day of your event. Any changes to your submitted floor plan must be submitted 2 weeks in advance or you will be responsible for any changes and re-sets. 8 maximum number of chairs per 5′ round tables. 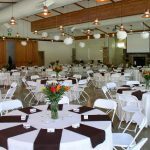 6-8 maximum number of chairs per 6′ banquet tables. 8-10 maximum number of chairs per 8′ banquet tables. Patio set up and tear down is the responsibility of the renter. On the floor plan place the furnishing you want outside on the patio and we will have them on carts by the doors. This interactive floor plan is for planning purposes only. A link will be sent to you via email approximately 60-90 days prior to your event. If you would like it earlier please email us at eec@adacounty.id.gov. This link cannot be submitted and is for preliminary planning purposes only. To keep the facility looking nice for all events we ask that all decorating rules are followed if you have questions please contact us at 208-577-4576 or eec@adacounty.id.gov. NO LOOSE GARBAGE ALLOWED IN TRASH BIN!